Pacific Orca is reportedly the largest wind farm installation vessel in the world. Image courtesy of Swire Blue Ocean A/S. The vessel is designed for installation of wind turbines and foundations up to a depth of 197ft. Image courtesy of Swire Pacific Limited. Pacific Orca was designed by Knud E Hansen and built by Samsung Heavy Industries at its shipyard in Geoje, South Korea. Image courtesy of Samsung Heavy Industries. Swire Pacific Offshore took delivery of its first wind farm installation vessel, Pacific Orca, in July 2012. Image courtesy of Samsung Heavy Industries. 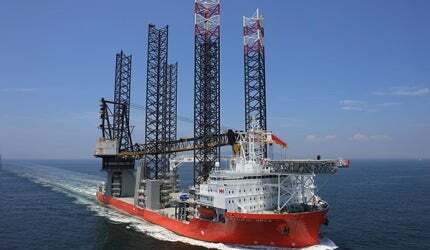 Pacific Orca is a purpose-built heavy-lift jack-up vessel owned by Swire Pacific Offshore (SPO). The self-elevating, self-propelled vessel has been built for use in the offshore wind farm market. With carrying and installation capability of up to 12 wind turbine generators (WTG), each rated at 3.6MW, she is the biggest wind farm installation vessel (WIV) in the world. SPO, a Singapore-based shipping company and wholly-owned subsidiary of Swire Pacific, contracted the South Korean shipbuilder Samsung Heavy Industries (SHI) to build the vessel in August 2010. The contract also included an option for the construction of another similar vessel. SPO exercised its option for the second WIV in March 2011. "The self-elevating, self-propelled vessel has been built for use in the offshore wind farm market." Pacific Orca was delivered in July 2012. She is built of Germanischer Lloyd class and will be utilised by the Danish energy company DONG Energy for turbine installation at an offshore wind farm. The second vessel, Pacific Osprey, is expected to be delivered at the end of 2012. She will be deployed in the German North Sea for the installation of DanTysk Offshore Wind Farm. Both the vessels will be operated by SPO’s wholly owned subsidiary Swire Blue Ocean (SBO). The vessel’s design, which was developed by the Danish architectural, engineering and design services provider Knud E Hansen (KEH), revolves mainly around safety, efficiency and reliability. The advanced design criteria of the vessel set up new industry standards for transit speed, lifting capacity, station keeping and jacking speed. The vessel can be deployed to conduct wind farm installation even under extremely rough weather and sea conditions. She is designed to withstand wind velocity of 65.6ft per second and significant wave heights of 8.2ft. "The advanced design criteria of the vessel set up new industry standards for transit speed, lifting capacity, station keeping and jacking speed." The vessel facilitates installation of offshore WTGs to a maximum depth of 197ft. She also allows installation of wind farms with ultra-large WTGs rated at 10MW or higher capacity. The vessel can be floated up to 56ft above the surface of the ocean using six jack-up legs fastened to the seabed. Each leg measures approximately 345ft in length. Pacific Orca provides accommodation for 111 people in single cabins. The overall length of the vessel is 527.9ft. Her moulded breadth is 160.7ft and the length between perpendiculars is 510.5ft. Depth to main deck is 34.1ft. Design draught and maximum draught are 18ft and 19.6ft respectively. The vessel’s dead weight at 18ft draught is 8,400t. Pacific Orca has a usable deck area in excess of 43,000 square feet with a cargo holding capacity of 4.6t per square feet. There is also a helicopter landing deck which measures 72.2ft in diameter. Its load-bearing capacity is 12.8t. The tank capacities of Pacific Orca include 141,259ft3 of marine gas oil, 1,589ft3 of lube oil, 52,972ft3 of fresh water, 349,615ft3 of ballast water and 42,378ft3 of sewage. The specialised wind turbine installation vessel, which can also be utilised as an offshore support vessel, is equipped with two cranes – a main crane and an auxiliary crane. The main crane’s primary hoist is capable of lifting 1,200t (with two hooks, each with a lifting capacity of 600t) at 101.7ft outreach. The auxiliary hoist has a maximum hoisting capacity of 500t at 164ft outreach. The crane is also provided with a whip hoist which can lift 50t at 360ft outreach. The auxiliary crane’s main hoist has a safe working load (SWL) of 35t and its maximum outreach capacity is approximately 98ft. The crane is fitted with an auxiliary hoist as well. Its SWL is 25t and maximum outreach capacity is about 131ft. The Swedish-Swiss power and automation technologies company ABB supplied an integrated electrical power and propulsion system for the Pacific Orca. The vessel is powered by eight diesel-electric main generator sets, each rated at 2.8MWe. A dynamic positioning class-two control system automatically maintains the position and heading of the vessel. For smooth manoeuvring, the vessel is fitted with four azimuth stern thrusters, each rated at 3.4MW, two bow retractable azimuth thrusters, each rated at 2.2MW, and two bow tunnel thrusters, each rated at 2.2MW.